GameStop is a video game shop. Use discounted gift cards on Nintendo, Playstation, Xbox items, and more. Just enter the card or account number and PIN on the payment page during the checkout process. The digital gift certificate number and PIN can be found in the email sent to the recipient. 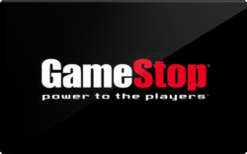 Buy a discounted Game Stop gift card to save money on top of sales and promo coupon codes for the best deal.